This elegant scallop and shrimp dish, drizzled with a sweet strawberry-flavored balsamic glaze, tastes like absolute heaven and is perfect for a romantic dinner for two. It's so much like a fine dining restaurant experience that you'll find yourself wanting to call the waiter over so you can send your compliments to the chef! Seared scallops are very impressive, yet so easy to cook you won't believe it until you do it yourself. The secret is to use a hot pan and not to move the scallops around. Searing shrimp is also a very easy way to bring out more of their natural sweetness. Use jumbo shrimp for this dish, as you want nice meaty bites of shrimp to go along with the scallops. Marinate the strawberries at least one hour ahead, though several hours (up to eight) is better. The slight bitterness of the arugula makes a nice contrast to the sweet flavors of the dish, but baby spinach is a good alternative. Let the shrimp sear for about one minute per side until just opaque. Remove and keep warm. Don't move the scallops until you can see a brown edge forming around the bottom (about two to two and a half minutes.) Carefully lift one scallop–if the surface has a nice caramelized color, turn it over. Cook for just another minute until the scallops are springy but not quite firm. (See cook's notes below) Remove the scallops and keep warm. Wipe out the pan, and then add the strawberries and vinegar. Remove the strawberries after they are heated through (about 30 seconds) and let the balsamic cook down briefly until thickened to a syrupy consistency. To serve, place the green on a plate, top with the scallops, shrimp, and strawberries, and then drizzle the balsamic reduction over the scallops and shrimp. To keep everything warm while you're cooking, put your oven on the lowest setting before you begin. A warm oven is great for heating plates too. 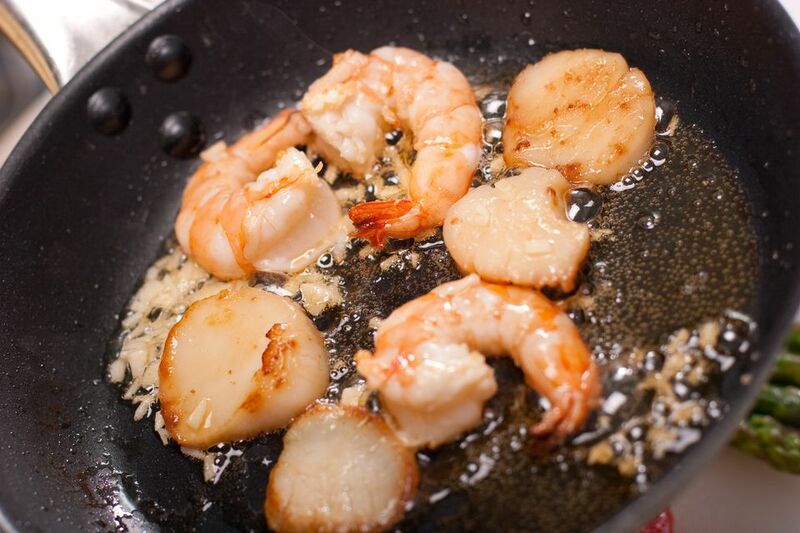 You can sear scallops in a 50/50 mixture of oil and clarified butter for extra flavor. Don't use regular butter, though: the milk solids can burn and impart a bitter flavor. The scallops are ready when they're well colored on both sides. There may still be a thin undercooked layer in the middle, but don't worry: the scallops will continue to cook from residual heat after you remove them from the pan and be perfectly tender.